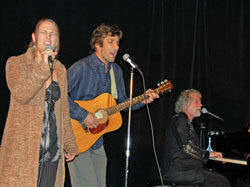 Wednesday’s reception was billed as an Evening With Emily Richards but the crowd got more than their money’s worth as they were entertained by many talented musicians. Emily is just incredible by herself, with amazing pipes and keyboard skills, and she has been appearing at the National Biodiesel Conference since 2004. 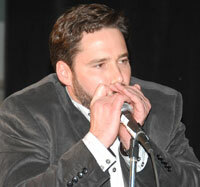 She was accompanied once again this year by guitarist and vocalist Jason Brock. Together they joined Rolling Stones keyboardist Chuck Leavell during his set for a rendition of “You Can’t Always Get What You Want,” which I unfortunately did not commit to video. However, I did get a recording of Emily and Joe Jobe (Piano Lady and Harmonica Man) doing Billy Joel’s “Piano Man” to rave reviews from the crowd. Joe is a man of many talents. 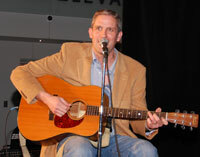 Later in the evening, NBB chairman Ed Hegland grabbed a guitar and revealed his musical talent as well. He sang a very funny tune called “All Right Guy” which also unfortunately missed being preserved for posterity’s sake to YouTube. Both Ed and Joe teamed up for a few impromptu numbers before letting Emily and Jason have the spotlight back. All in all, it was a very enjoyable evening with Emily and Company. No word yet on when Joe and Ed will be leaving their day jobs and going on tour!